Brandon Purdy waits for the snap before kicking an extra point against Northern Colorado in 2017. 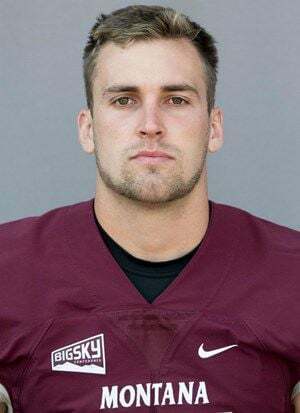 The Glacier grad technically can’t lose when the Griz play their spring game there at 1 p.m. Saturday, but he surely can continue to help his case toward recapturing the starting job as Montana’s kicker for field goals and extra points. And he’ll have the opportunity to do it in front of family and possibly friends. When the Griz spring game was last in Kalispell in 2006, Purdy had never played football. An avid soccer player, he tried out for football in sixth grade at Kalispell Middle School but suffered what he was told was a concussion. The 5-foot-10, 176-pound Purdy continued playing soccer until the summer between his sophomore and junior years of high school, when he heard the football team was looking for a kicker. He was soon suiting up in shoulder pads after he got permission from the school to play both soccer and football in the fall. Purdy’s special teams play helped Glacier finish second in the state in 2013 and win the championship in 2014 under head coach Grady Bennett, a former Montana quarterback. In just two years, Purdy set and still owns state records for single-season extra points (71) and career extra points (128). His 13 career field goals are tied for fourth most in the state, and his 48-yarder is the longest in school history. One of Purdy’s more vivid memories came in the playoffs when Glacier lined up for an onside kick. After walking on at Montana, Purdy was the backup kicker in 2016 and earned the starting spot kicking field goals and extra points in 2017 under former coach Bob Stitt. He picked up All-Big Sky third-team honors, and his 88.2 conversion percentage on field goals (15 of 17) ranked third in the FCS. When Bobby Hauck took over for Stitt, Purdy ended up missing spring ball in 2018 because of an injury. Tim Semenza went on to earn the starting job, and Purdy didn’t play that season. This spring, Purdy and Gabe Peppenger, a Sentinel grad and Montana State transfer, have been competing to handle field goals and extra points. Semenza, the second-most accurate kicker in Griz history, is forgoing his senior season to take a job with a software and consulting company. In the fall, true freshmen Brian Buschini, from Helena Capital, and Carver Gilman, from Whitefish, will join the team to potentially add more competition. “The way things are set up here, every kick counts,” Purdy said. “They’re tracking it. We’re looking at our operation times every day. We get our percentages sent to us every day. When Purdy returns to Legends Stadium, he’ll be wearing a different jersey than last time. And there’s also one other change that’ll be a bonus. One of Hauck’s go-to sayings the past month has been that the goal of spring practice is to improve. Another saying is that live reps are the only way to get better. The Griz will get one more go-around when they close their slate of 15 practices on Saturday. In addition to Purdy, the other Glacier grads making their returns to Kalispell are sophomore linebacker Patrick O’Connell and four redshirt freshmen in safety Jackson Pepe, running back Drew Turner, offensive tackle Cody Hartsoch and tight end Max Morris. The road trip offers the team a practical benefit beyond some players playing in front of family.